Before we get this party started, I have to say I'm SO sorry to abandon you last week! I was sick and totally forgot about our party. The day just slipped right past me!! But, I'm with it this week, and it's good thing because I leave in the morning for SNAP! Conference in lovely Utah. Who's with me?? 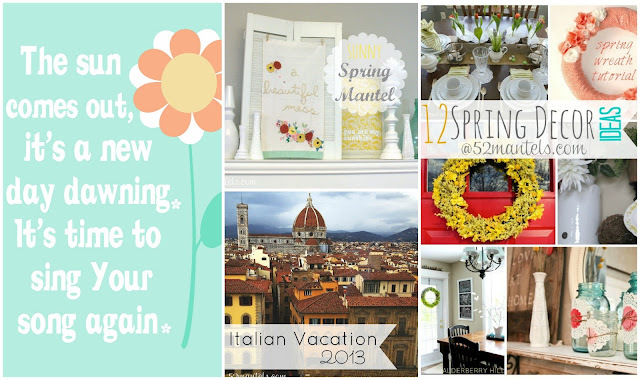 Clockwise, from left: a free Springy printable ~ My new, Sunny Spring Mantel ~ Spring Decor Ideas (party features!) ~ Details from my trip to Italy! And, PSSST...don't forget to enter to win one of TWO awesome prizes, including a $100 Anthropologie gift card! Thanks so much for hosting - hope you have a wonderful trip! Thanks for hosting Emily! Safe travels! Thanks for the fantastic party!! Thanks for hosting. Glad you are feeling better! Enjoy SNAP! Thanks for hosting Emily! Enjoy the conference in Utah! Thanks so much for hosting Emily... glad you are feeling better and enjoy your conference!! Thanks for the great party, Emily! THANKS so much for hosting, Em! Thank you so much for hosting Emily, have a great time at SNAP!! Just found your linky party and I'm joining in for the first time. Thanks so much for hosting. Hope you have a great week! Em, thanks for hosting! Hope you have a great time this weekend.